Is the IKEA Poang Chair useful in a sensory diet? We are at the beginning of providing a sensory diet for our 6 year old. She needs to bounce, safely and/or rock safely. Our house is not big enough for a regular rocking chair,a trampoline is also not possible. She likes to sit cross legged so children sized rocking chairs have also been rejected (by her!)... We were in IKEA today and the Poang chair seems to give a nice feel it sort of bounces and rocks. It certainly made my head feel nice. Comments for Is the IKEA Poang Chair useful in a sensory diet? It used to drive my parents crazy to wake up in the middle of the night and find their 5 year-old little girl bouncing the springs right out of the back of their sofa (and into the wall)! Eventually they got me my own swing-set which provided me with thousands (literally?!) of hours of what i needed...But we got one of those large, exercise balls for our 5 year-old son (who seems to have inherited mom's penchant for bouncing) who found just the right corner to tuck it into (between our bed and the dresser) and your child will find just the right place too. Now he can bounce happily away for hours on-end and we use the ball with him in so many other ways too. It's portable, movable and you can adjust the size by filling it with more or less air as you like. But beware: you may need to find the right floor-covering so that your child's bottom doesn't scoot out as he/she bounces. A rubber-backed floor rug works great for us. Above all, have fun! I have used a similar chair with teenagers. It can be very soothing. A word of caution- chair of this design can tip over if someone of average size sits at the edge. (it will tip forward) Just remind the person who uses this chair, to not sit or move from the front edge of the chair. IKEA sells another chair we have I cant remember it's name though. It looks like a giant bag that hangs from the ceiling. Both my kids love it and they have opposite sensory issues. 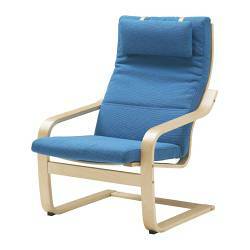 The IKEA Poang chair offers a subtle rocking / bouncing that can be very calming. It can only be used within a short range of motion which may be effective or frustrating depending on what your child is seeking. The best way to find out is to have your child try one. If IKEA is too stressful an environment (I find it to be), a cheap alternative to buying one is Craigslist. I have seen several advertised there. Good luck! Join in and write your own page! It's easy to do. How? Simply click here to return to Sensory Diet.